As you may know, I’m a huge fan of the chapbook – short stories published in dedicated pockets of fiction. Nightjar Press is just one fine example of what’s good in the genre, and I’ve mentioned it before on this site. What I want to briefly speak about today is the newest kid on the block. 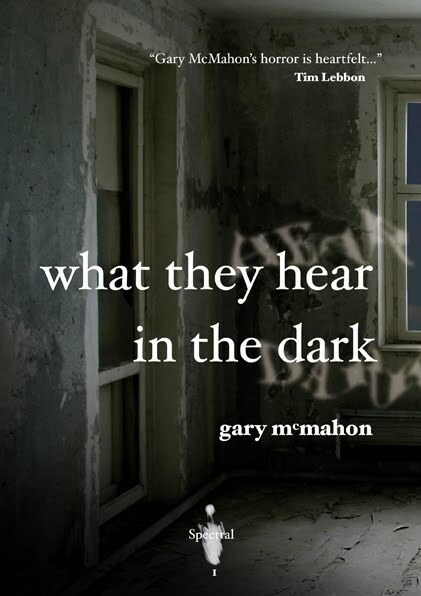 Spectral Press, the brainchild of writer/editor/artist Simon Marshall-Jones has just released its inaugural chapbook, “What They Hear in the Dark” by Gary McMahon. I’m a dedicated fan of Gary McMahon’s fiction. If you’ve ever read anything written by him, all I’ll say is that this story achieves his usual standards of quality and style. I won’t bother to summarise the set-up, suffice to say its themes of grief and humanity are starkly compelling. It’s easy to take McMahon for granted; he never disappoints, but what impressed me more than anything with this release was the production quality. The artwork is beautiful, and perfectly suits the story. The paper stock is good, the typeset is clear and perfect. Spectral Press obviously values quality in its products, and that is apparent in this release. The individual chapbook costs £3.50 including postage but you can purchase a yearly subscription, which bags you the first 3 releases – as well as McMahon’s, there is one by Gary Fry and one from Cate Gardner – for just £10. That, my friends, for a limited release of just 100 signed copies, is an absolute bargain! I’ve seen a list of the writers that are lined up for forthcoming chapbooks, and I can tell you there’s some serious talent in there. You won’t want to miss out. Click here for more info. While I’m on the subject, I also recently finished reading McMahon’s novel from Angry Robot, Pretty Little Dead Things. Its central character, Thomas Usher, is damaged in many ways, none more so than the fact that he is haunted by the ghosts of the recently departed. With his wife and daughter dead – and Usher tormented by guilt and loss – his only solace is the manner in which he aids those that need help. The theme that fuels this novel, and indeed much of McMahon’s fiction, is momento mori – remember that you will die. It’s a theme that reminds us exactly why we do what we do. McMahon is never afraid to shine light on the places that we’re afraid to see, to tell us the things we don’t want to hear. The honesty in his storytelling, and the skills he uses to tell that tale, are what make him one of the best writers working in the genre today. This is the Amazon link to order it.